Update 21 April 2018: Information released today by US Air Forces Central Command (AFCENT) indicates that standard JASSM cruise missiles were used in the strikes, not the JASSM-ER as previously reported by the Pentagon. A spokesman also noted that F-22 Raptors took part in the operation, presumably flying counter-air. A good summary has been posted at The Aviationist. 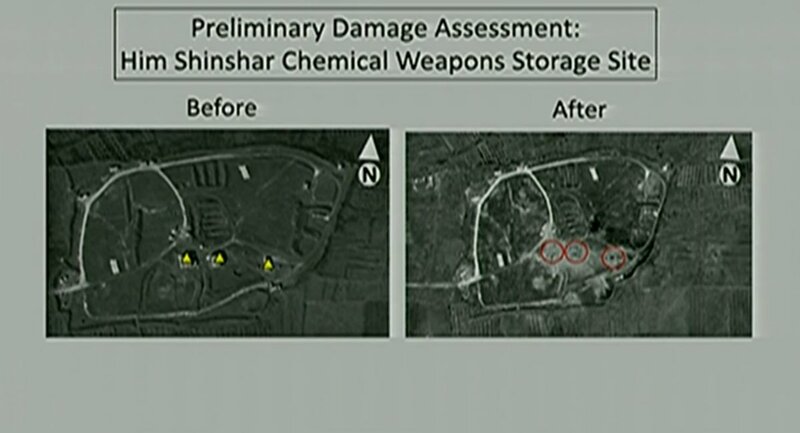 Shortly after 0400 local time on 14 April 2018, a multi-national US, British, and French operation struck several chemical weapons (CW) production, research, and storage facilities in Syria. Three separate target sites were engaged, two west of Homs and one in Damascus. 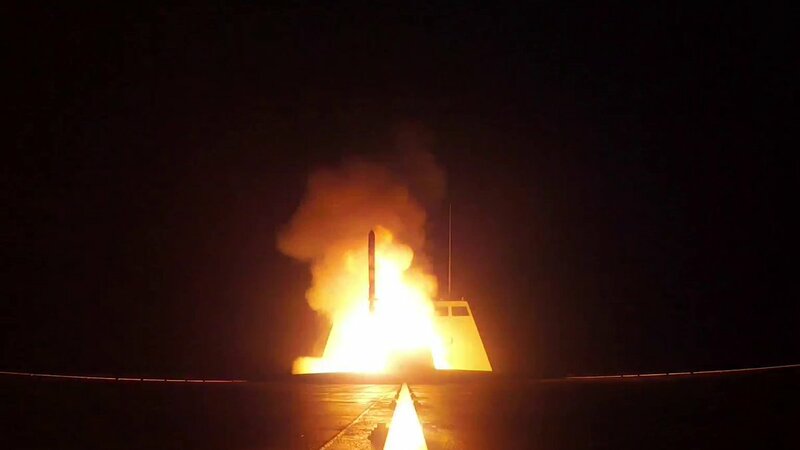 USMC Lt. Gen. Kenneth ‘Frank’ McKenzie indicated that all of the target sites were successfully engaged “without material interference from Syria”, and that no attacking aircraft or missiles were intercepted. 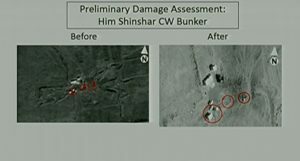 According to General McKenzie, the Syrian government launched more than 40 surface-to-air missiles with most of them launched “after the last impact of [the] strike”. He also noted that it is “likely the regime shot many on a ballistic trajectory” (i.e. unguided), which could cause collateral harm. No Russian air defences were employed. General McKenzie claimed that the coordinated strike mission will “significantly impact the Syrian regime’s ability to develop, deploy, and use chemical weapons”, and called the Barzah facility, which bore the brunt of the attack, “the heart of the Syrian chemical weapons program”. 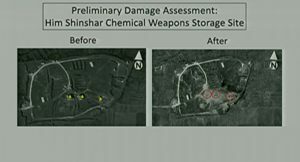 He indicated that Coalition forces believe they have “successfully mitigated against” CW release at the sites struck, even though they assess that quantities of CW (both chlorine and sarin) and precursor chemicals were present in some or all of the locations. 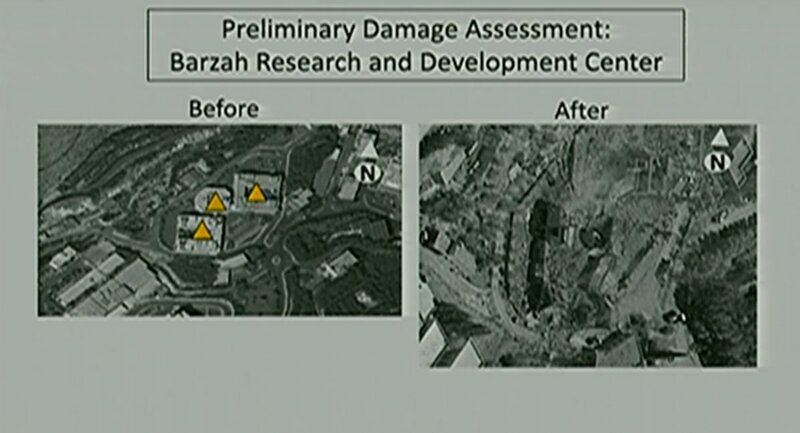 McKenzie attributed the mitigation of this threat – and the Coalition’s assessment that no civilians were harmed in the strikes – to various factors, including the overall intelligence picture, the time of the strike, attack profile, weaponeering, and plume analysis. He said, “you balance, always, minimising collateral damage against achieving maximum military effect”. Two of these weapons, the JASSM-ER and the MdCN, saw their first operational use in this strike. Some footage of MdCN missiles being launched has been released, as well as the photograph used as the header image for this article. Early indications are that both the JASSM-ER and the MdCN performed as designed. It is not clear if President Trump was referring to the first use of the JASSM-ER when he tweeted regarding “missiles”, “they will be coming, nice and new and “smart!””. A TLAM cruise missile being launched from the USS Monterey (CG-61) in the Red Sea (source: US DoD). Additional fighter aircraft (including RAF Typhoon FGR.Mk4, ALA Mirage 2000-5, and USAF F-15C & F-16C models) accompanied the ‘shooters’ during the strikes. Defensive counter-air was also positioned in the theatre, to protect against the possibility of hostile forces launching aircraft to engage the attackers. Tanker (including USAF KC-135 & KC-10, and ALA C-135FR); electronic warfare (including USMC EA-6B); airborne early warning and control (AEW&C) and communications (including ALA E-3F and USAF E-11A); and intelligence, surveillance, and reconnaissance (ISR) (including USAF RQ-4B UAV & RC-135V) aircraft also took part in the operation. US Navy P-8A maritime patrol aircraft also appear to have been active in the area. 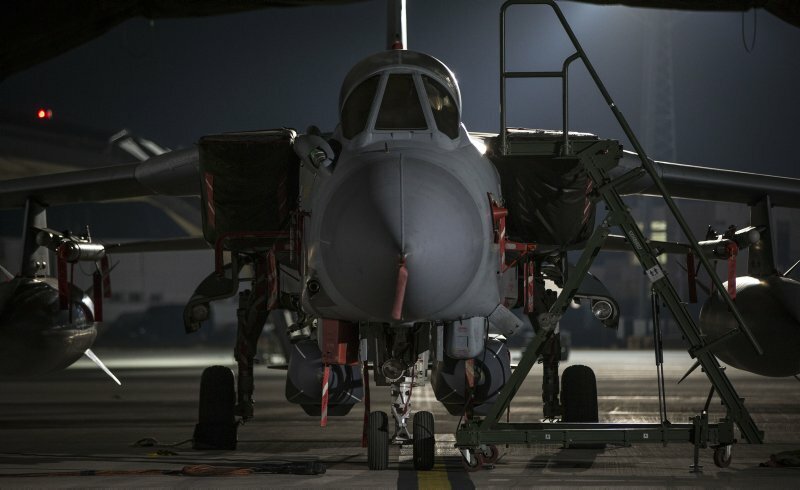 A RAF Panavia Tornado GR.Mk4 of the 903 Expeditionary Air Wing (EAW), before taking off from RAF Akrotiri, Cyprus (source: UK MoD). 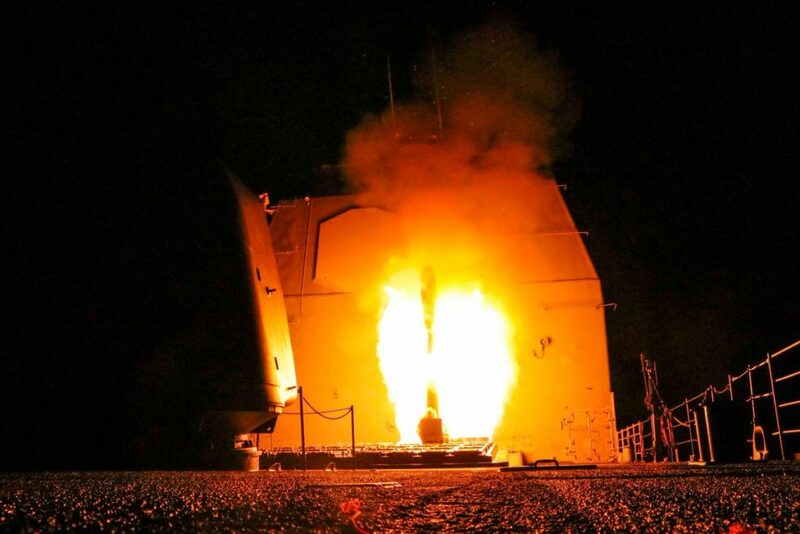 Header image: MdCN cruise missile being launched from FS Languedoc, an Aquitaine-class destroyer (source: French MoD).